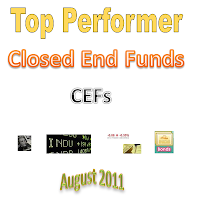 Closed end funds, or CEFs in short, can be one of the attractive fund for investor to invest. The following is the top performers are sorted based on its year-to-date performance of the fund market price. These top performing funds can be any of the following categories: bond funds (fixed income funds), stock funds (equity funds), commodity funds, multi sector funds, and alternative funds. Check the funds details below for the fund category. Note: some of these fund may be traded either premium or discount from their net asset value (NAV). The Cornerstone Total Return Fund seeks capital appreciation with current income. This Cornerstone fund will invest in common stocks, preferred stocks and convertible stock of large, mid and small cap companies and investment grade US debt securities. The fund is managed by Cornerstone Advisors Inc. 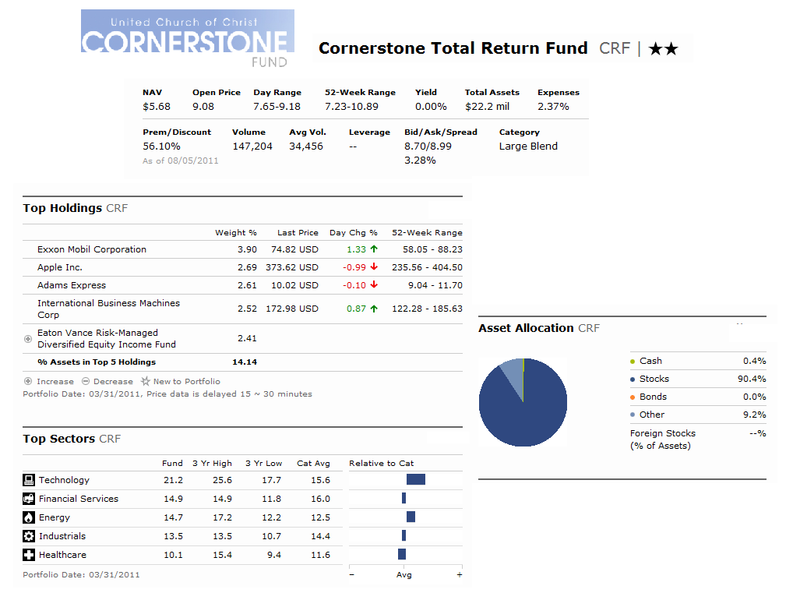 The expense ratio of this Cornerstone fund is 2.36% per year. It has no effective leverage. The fund has returned -1.02% over the past year and 15.16% over the past ten years. This fund is rated 2 stars by Morningstar. As of March 2011, the top 5 holdings of this CRF fund are Exxon Mobil Corporation (3.90%), Apple Inc (2.69%), Adams Express (2.61%), IBM Corp (2.52%) and Eaton Vance Risk-Managed Diversified Equity Income Fund (2.41%). The top sectors of this fund are Technology (21.2%), Financial Services (14.9%), Energy (14.7%), Industrials (13.5%) and Healthcare (10.1%). 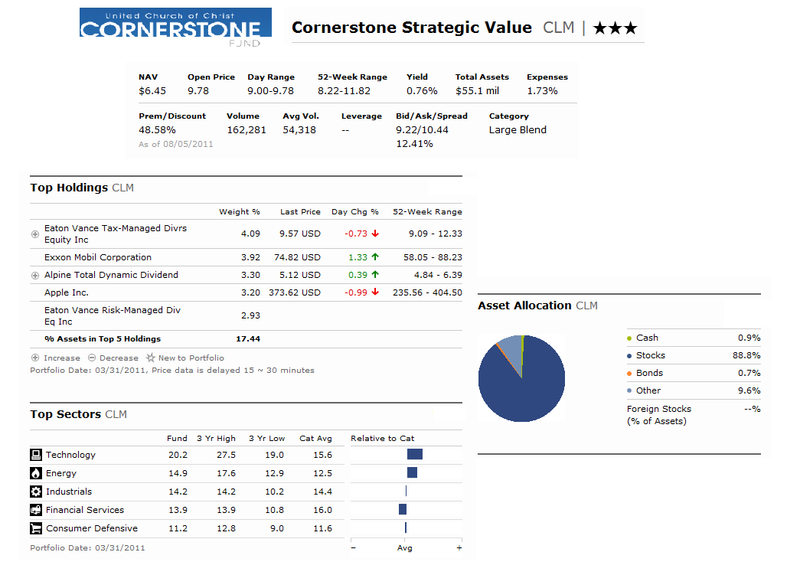 This is the second Cornerstone fund in this top performers list. The Cornerstone Strategic Value Fund seeks long term capital appreciation through investment in global equity securities. The fund is managed by Cornerstone Advisors Inc. and managed by Bradshaw since 2001 and Clark since 2003. The fund expense ratio is 1.74% annually. The distribution rate is 15.99% per year and is distributed monthly. The fund total net assets are $55 million. It currently sells at 38.78% premium from its NAV. As of March 2011, there are 152 holdings of this fund. The top five holdings represent 17.44% of total net assets. They are Eaton Vance Tax-Managed Diversified Equity Income (4.09%), Exxon Mobil Corp (3.92%), Alpine Total Dynamic Dividend (3.30%), Apple Inc (3.20%), and Eaton Vance Risk-Managed Div Equity Income (2.93%). The top 5 sectors are Technology (20.2%), Energy (14.9%), Industrials (14.2%), Financial Services (13.9%) and Consumer Defensive (11.2%). The PIMCO Corporate Opportunity fund objective is to provide high current income with capital appreciation. As part of Allianz Global Investors division, this PIMCO fund will invest in corporate debt obligations and other corporate income producing securities. While famous for its bond mutual fund, PIMCO also provides variety of bond closed end funds. This is also one of the largest CEFs in term of asset with $1.1 billion. The annual expense ratio of this PTY fund is 1.02%. The fund is managed by William Gross since 2009. This fund was introduced to public in 2002. The fund market price is traded at 19.07% premium from its fund’s NAV. Morningstar has rated this CEF fund with 5-stars rating. The fund consists of 429 bonds and it has 6.91 years average duration. The fund sponsor is Allianz Global Investors Fund Management LLC. As May 2011, the fund yield is 12.45% per year. The dividend rate is 7.15% and it is paid monthly. As of June 2011, the fund top five sectors are Banks (27%), Insurance Life (14%), Non-Captive Consumer Finance (14%), Electric Utility (6%) and Insurance P&C (5%). The Central Gold-Trust fund objective is to seek a secure, convenient, low-cost, exchange-tradable investment alternative for investors interested in holding gold bullion. This Central GoldTrust fund is a passive, self-governing, single purpose trust established to buy and hold substantially all of its assets in gold bullion. This Central Gold Trust fund has 0.40% annual expense ratio. The fund total net asset is $ 1.0 billion with 0% effective leverage. This fund is in the category of US Equity-Commodities. This fund hasn’t gotten any rate from Morningstar yet, as it was introduced to public in 2006. It currently sells at 3.12% premium from its NAV. If there is distribution, it will be paid annually. As of December 2010, the top sectors of this fund are Gold Bullion (98.21%), Net Current Assets (1.69%) and Debt-Short (0.90%). 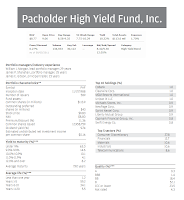 As part of high yield bond fund, the Pacholder High Yield fund is seeking to provide a high level of total return through current income and capital appreciation by investing primarily in high yield, high risk fixed-income securities of domestic companies. 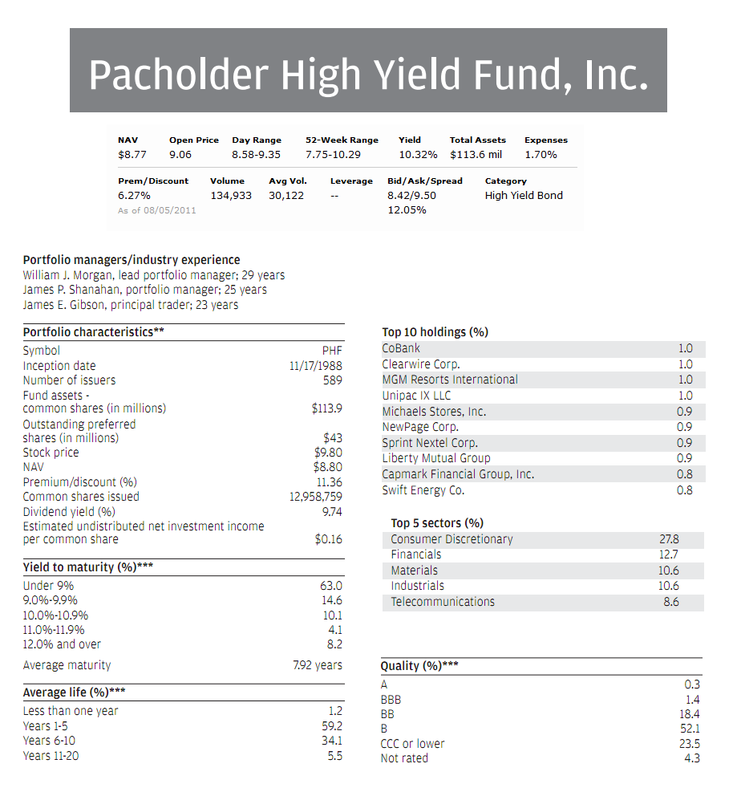 This Pacholder High Yield’s fund sponsor is JP Morgan Investment Management Inc. This PHF fund is managed by Morgan, Shanahan and Gibson. This closed end fund current total net asset is $113.6 million. 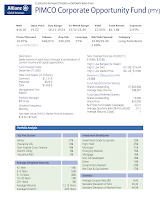 The fund also charges 2.37% annual expense ratio including 1.88% management fees and 0.49% other expense. The fund market price is traded at 6.27% premium from its NAV. This fund is rated with 4-stars rating from Morningstar. The average maturity of this fund is 7.92 years. The fund market price has returned 22.57% over the past year and 10.53% over the past 5 year. The year to date performance is 16.20% (until May 8th, 2011). As of June 2011, the top ten holdings of this fund are CoBank (1.0%), Clearwire Corp (1.0%), MGM Resorts International (1.0%), Unipac IX LLC (1.0%), Michaels Stores Inc (0.9%), NewPage Corp (0.9%), Sprint Nextel Corp (0.9%), Liberty Mutual Group (0.9%), Capmark Financial Group Inc (0.8%) and Swift Energy Co (0.8%). The top 5 sectors are Consumer Discretionary, Financials, Materials, Industrials and Telecommunications. This is the second high yield corporate bond fund in this top performing funds list. 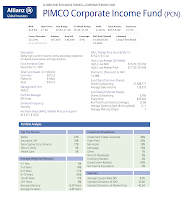 This PIMCO Corporate Income Fund seeks to reach high current income and its other investment objectives by investing >80% of its total assets in a diversified portfolio of U.S. dollar-denominated corporate debt obligations of varying maturities and other corporate income-producing securities. 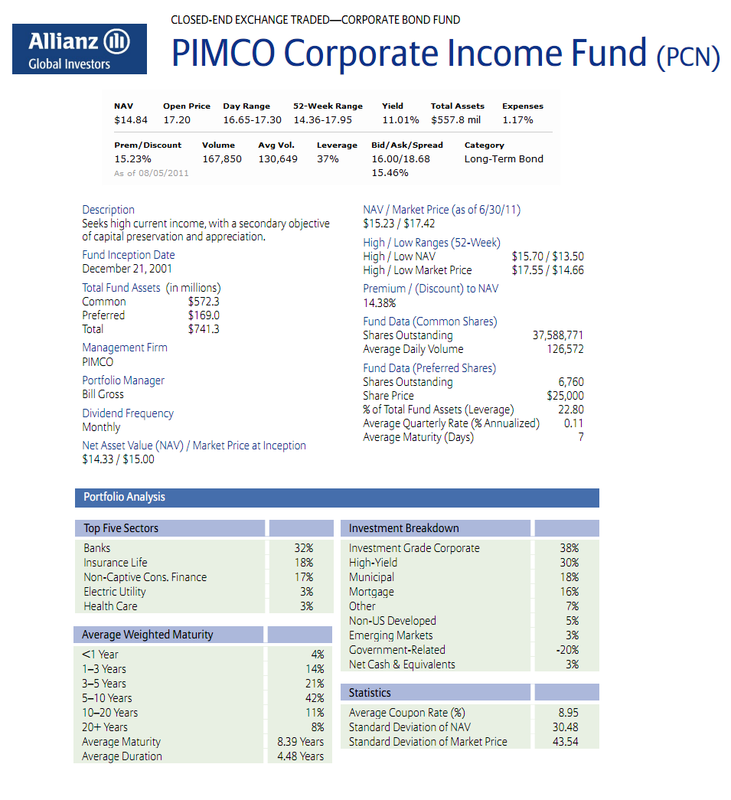 This PIMCO fund has been managed by Mark Kiesel since 2005 and later William Gross joined in 2009. The fund total net assets are $ 557.8 million. 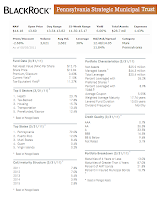 The fund annual expense ratio is 1.23% (0.99% management fees and 0.17% other expense). The distribution rate of this fund is 7.46% and is distributed on monthly basis. It currently sells at 15.23% premium from its NAV. 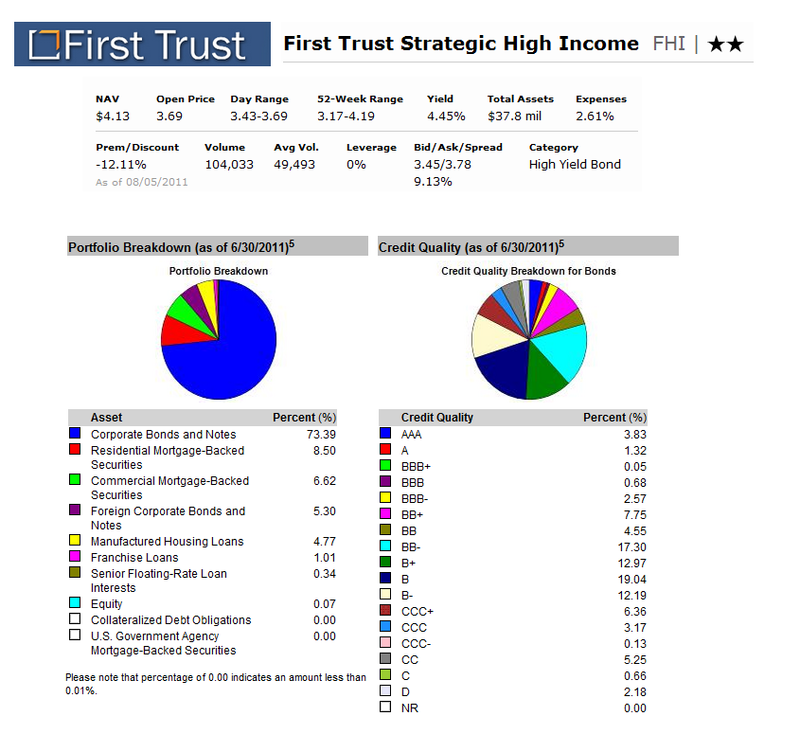 As of June 2011, the top 5 sectors of this PIMCO fund are Banks (32%), Insurance Life (18%), Non-Captive Cons. Finance (17%), Electric Utility (3%) and Health Care (3%). This BlackRock Pennsylvania Strategic Municipal fund objective is to provide current income exempt from Federal and PA state income tax. This BlackRock muni bond fund invest most of assets in investment grade municipal bonds. The team managers of this fund are Soccio (since 2008), Jaeckel, Jr. (since 2006) and O’Connor (since 2006). This fund has total net assets of $28.7 million. The monthly distribution rate of this BPS fund is 6.61%. It currently sells at -2.68% discount from its NAV. This fund has 1.60% annual expense ratio. It also has 0.27% preferred shareholder distributions. As of March 2011, the top 5 sectors of this BPS fund are Health (23.1%), Tax-Backed (17.8%), Housing (15.7%), Transportation (13.4%) and Prerefunded / Escrow (12.4%). The top 5 states are Pennsylvania (79.0%), Puerto Rico (12.0%), Multi States (8.4%), Guam (0.4%) and Virgin Islands (0.2%). The Aberdeen Global Income fund is seeking to provide high current income. This Aberdeen fund will invest in high-grade, fixed-income securities denominated in the currencies of Australia, Canada, New Zealand, and the United Kingdom. As a secondary investment objective, the Fund seeks capital appreciation, but only when consistent with its principal objective. This Aberdeen Global Income Fund is managed by teams that are based in Singapore, Sydney & London. The current monthly distribution as per July 2011 is 7.0 cents. 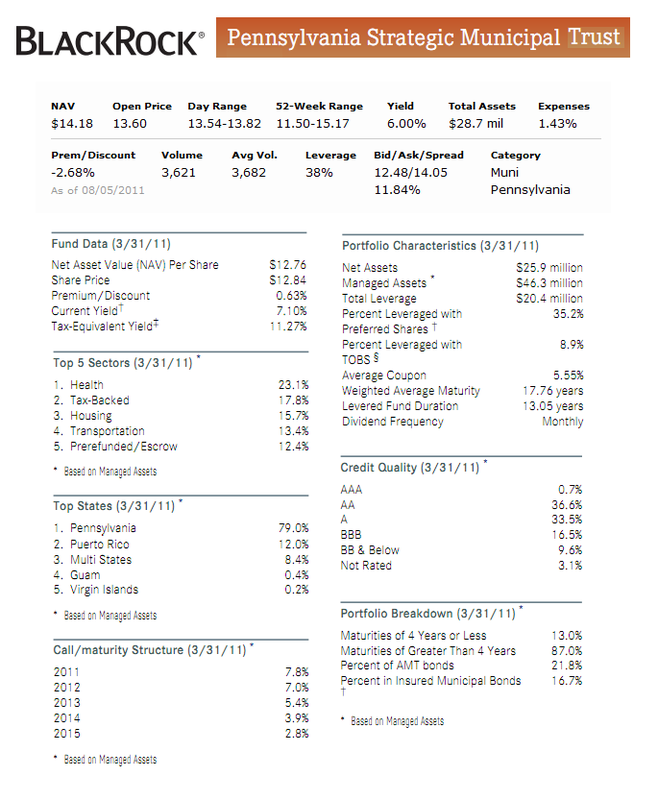 This fund has 2.48% annual expense ratio. The total net assets are $124.6 million. This fund market price has returned 14.30% over the past year and 11.65% over the past ten years. This FCO fund has 10.31% YTD return. 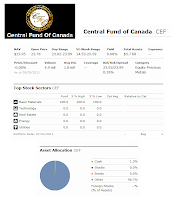 The top holdings of this fund as of June 2011 are United Kingdom GILT, Australia Government Bond, New Zealand Government, Canadian Government, Treasury Corporation of Victoria and Quebec Hydro. The top geographic exposures are Australia (20.2%), Emerging Markets (17.4%), New Zealand (16.6%), United Kingdom (13.7%) and Canada (13.1%). 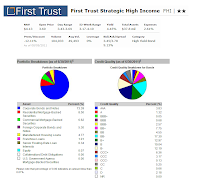 This First Trust Strategic High Income fund seeks a high level of current income by investing at least 80% of its managed assets in a wide range of below investment grade debt securities. This FHI fund is managed by First Trust Advisors L.P. team and the servicing agent is BNY Mellon Investment Servicing (US) Inc. This fund is the high yield bond. The fund has an annual expense ratio of 2.68% (include 2.61% baseline expenses and 0.07% interest expense). The distribution rate of this fund is 9.92% and it is distributed monthly. This trailing total return of this First Trust fund is 18.30% over the past year. It has 15.55% YTD return. 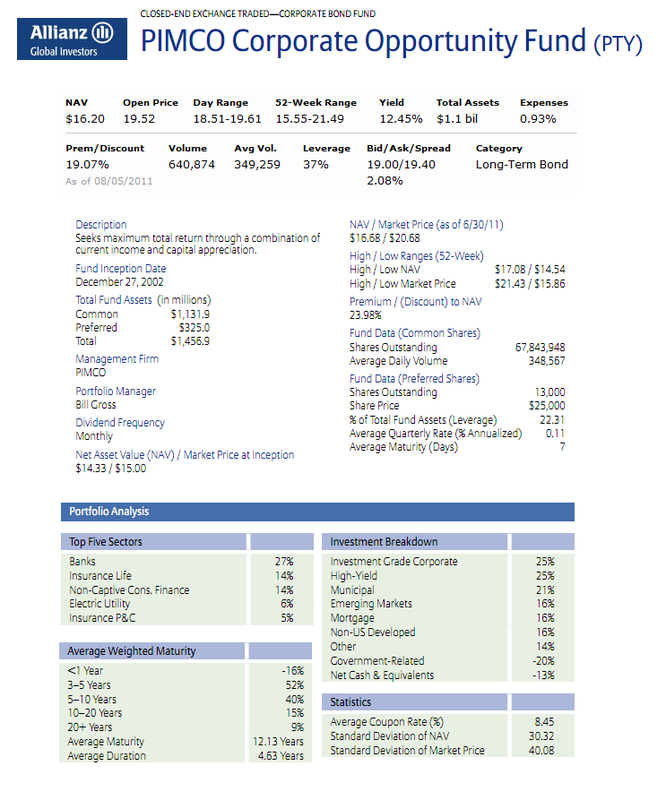 This fund has 5.61 years of average effective maturity. This fund has gotten 2-stars rating from Morningstar. 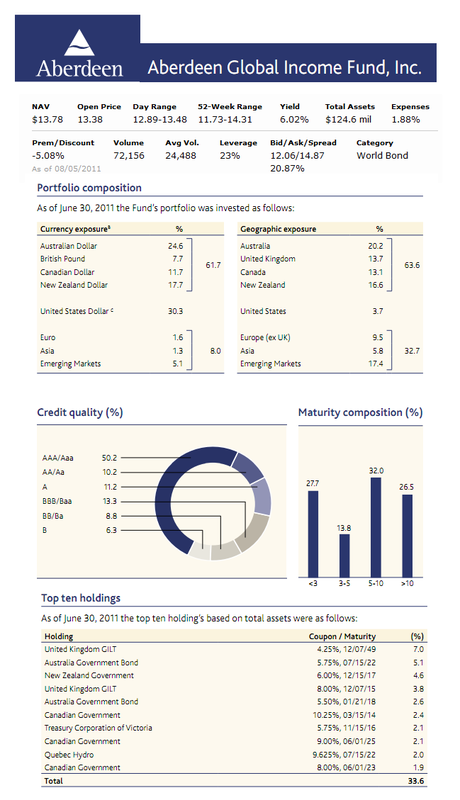 The top portfolio breakdown as of June 2011 is Corporate Bonds and Notes (73.39%), Residential Mortgage-Backed Securities (8.50%), Commercial Mortgage-Backed Securities (6.62%) and Foreign Corporate Bonds and Notes (5.30%). As the commodity fund, this Central Fund of Canada fund seeks to provide an investment alternative for investors interested in holding marketable gold and silver related investments. This CEF’s fund sponsor is Central Group Alberta Ltd. The fund’s manager is J. C. Stefan Spicer since 1995. This precious metals fund has 0.04% annually distribution rate. The annual expense ratio of this fund is 0.34%. The market price of this fund has returned 63.09% over the past year and 22.87% over the past decade. The YTD return of this fund is 15.44%. 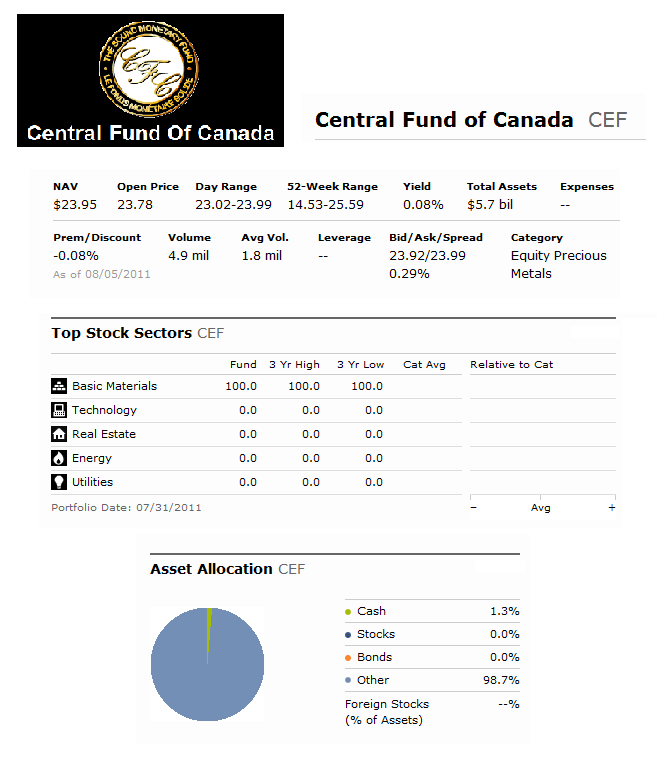 This Central Fund of Canada is investing 100% in basic materials stock sectors.